Ramen has always been a go-to meal for frugal foodies, college students, and anyone else who loves a soothing, cheap, and easy meal. And while instant ramen is delicious (and can easily be improved), making a simple homemade ramen is even better, and nearly as easy. Most people, however, don't have plain ramen noodles sitting around in their pantry. And if you're anything like me, you crave ramen when you're sick or really, really hungry; generally, those are not opportune times to make a trip to the store. I've tried substituting spaghetti for ramen noodles, and the results have been less than stellar; the texture is just not quite right. But then someone clued me into the secret to converting spaghetti into ramen: baking soda. The result is my new favorite ramen hack. Ramen noodles have a springier, stronger texture than spaghetti and a distinct savory taste thanks to kansui, i.e., alkaline elements usually added to the ramen dough. Kansui isn't easy to find for most home cooks, so in this case, baking soda, which is alkaline, makes a fine substitue. Note: you can even bake your baking soda, to make it a stronger alkali and improve the subsequent flavor of your noodles. 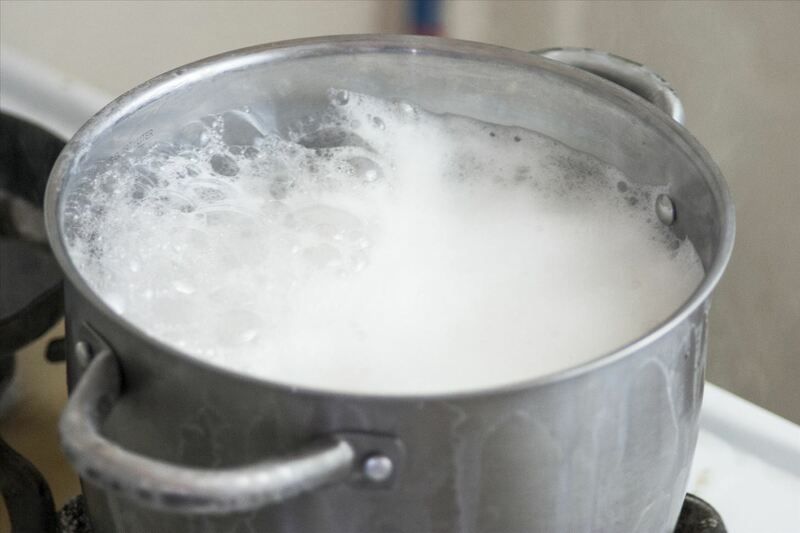 Boil water as though you were making a batch of pasta: in a big pot, with a healthy amount of water. 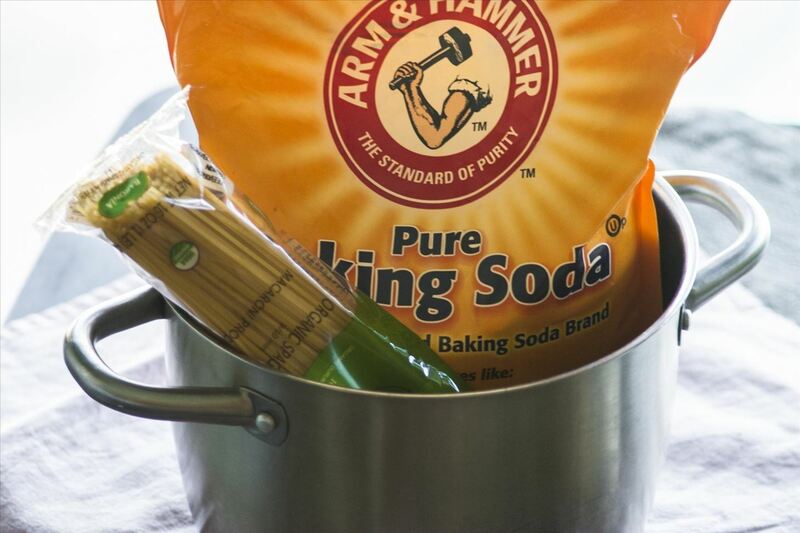 When the pasta water is boiling, add a tablespoon of baking soda. The first time I tried this, I made the mistake of dumping all of the baking soda in at once; the result was a baking soda volcano that spilled all over my stove. So I highly recommend that you add the baking soda slowly, to keep the chemical reaction from ruining this hack. Even if you add the baking soda slowly, the water will still bubble and foam, so make sure that you keep a close eye on it. When the water and baking soda mixture has subsided, add your spaghetti. Keep a very close eye on it, as the spaghetti will trigger the baking soda and cause another mini-eruption. When the spaghetti is nice and tender, strain it. The baking soda will have made the spaghetti more springy, like ramen, and will also have turned it a ramen-colored shade of yellow, as you can see in pictures. 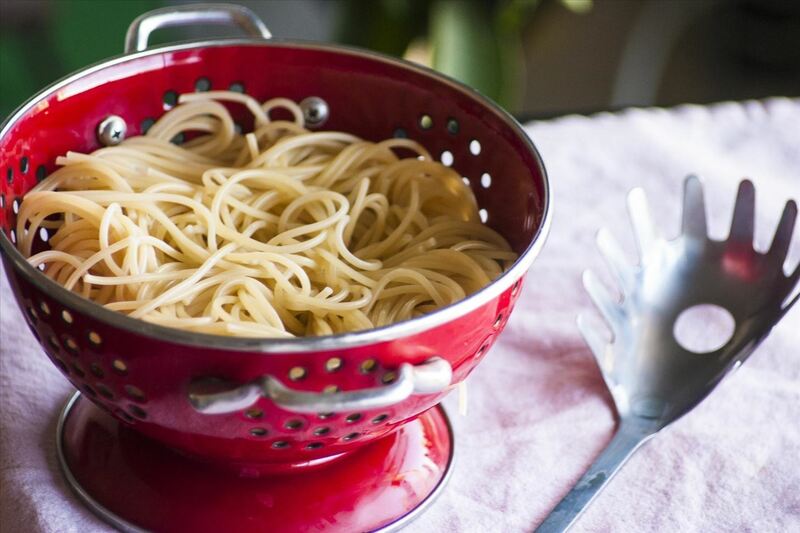 Spaghetti cooked without baking soda. Spaghetti cooked with baking soda. 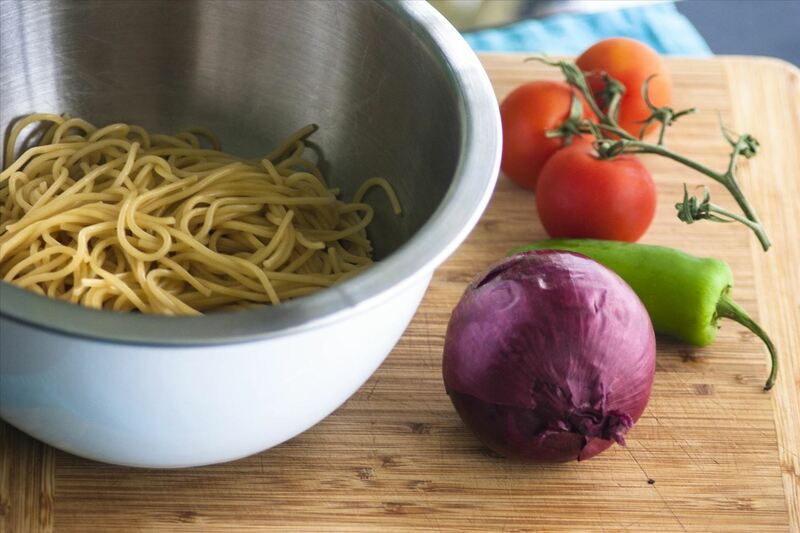 With your homemade ramen complete, all you need to do is to add some broth and a few veggies or herbs, and you'll have a spectacular bowl of ramen. If it's not enough like ramen for your taste, you can add more baking soda the next time around, but adjust in small increments; if you add too much baking soda, the ramen will taste very odd. The lesson, as always: baking soda is a secret hero in the kitchen. Be it for caramelizing onions, neutralizing bitter flavors, making authentic-tasting soft pretzels (without lye), or any number of brilliant things, baking soda is an indispensable ingredient. How To: How We Feasted Like Kings on… Instant Ramen? does it still taste good just with spaghetti baking soda? What is the water to baking soda ratio used?